Blue jeans, T-shirts, shoes, jackets - our clothes. How do we use clothing verbs the right way? How about phrasal verbs for clothes? When you go clothes shopping or if you're interested in fashion, you want to be correct, whether you dress up (to dress in your best clothes) or dress down (dress informally). - Ricky "got dressed" for work after breakfast. - Francesca "dresses" her baby in adorable outfits. Now, what is the opposite of getting dressed? Getting undressed, or to undress. 2) How about the phrasal verb put on? = to dress yourself or someone else with an item or items of clothing. This is not exactly like getting dressed because with "put on" you must be specific about the clothing item. - Sally "put on" her new leather jacket and took a selfie. - When Marco saw the Ray-Ban sunglasses, he "put them on" and admired himself in the mirror. The opposite? Take off = To remove any item of clothing. - "Take off" your shoes before walking on the carpet. - It was so hot this afternoon, George "took off" his jacket and tie. 3) When you're in a store and want to see how something fits or looks on you? You try on. 4) If you put on an item of clothing quickly and without thought, you throw on. 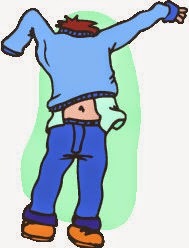 5) To wear = to have an item of clothing on one's self. - The bride "wore" her mother's wedding dress. - Mike always "wears" a suit to the office. You can also use wear to talk about a particular facial expression, or to describe a person's hair or beard/mustache (length or style). Martin was "wearing" a big grin (smile) after his interview. Holly and her boyfriend both "wear" their hair long. Matteo's brother "wears" a handlebar mustache.